When research on wild killer whales began in the 1970s it was not known that there were more than one kind of orca inhabiting waters of the North Pacific Ocean. 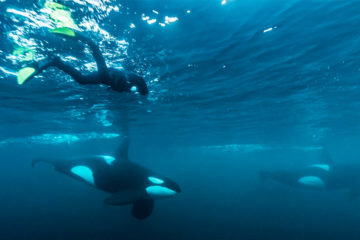 However, after several years of field studies, researchers working in British Columbia began to notice that some of the killer whales they encountered behaved differently from the orcas that were resident to their study areas. 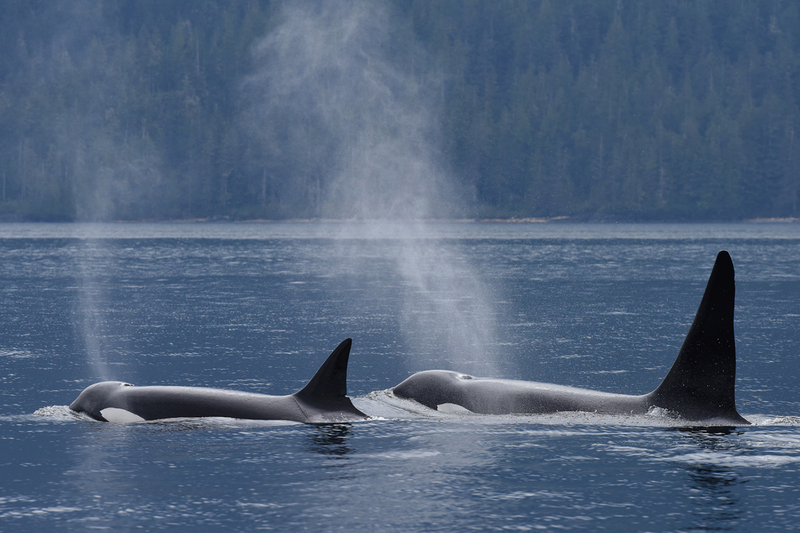 This group of researchers led by Dr. Michael Bigg, a marine mammal specialist with the Canadian Department of Fisheries and Oceans, called these killer whales Transients because of their unpredictable movements around the coast of British Columbia. 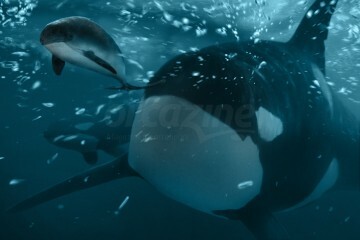 At the time that Bigg’s research began, several killer whales had already been captured in waters off the west coast of Canada and transferred into aquariums. Many had died in the process but some were adjusting well to new lives in tanks. 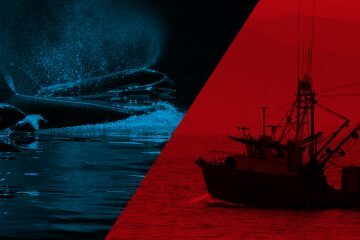 Due to ethical concerns about this industry and how it may have been affecting wild stocks, the Canadian Department of Fisheries and Oceans tasked Bigg with conducting a population assessment and providing scientific advice to be used towards managing the fishery for live orcas. 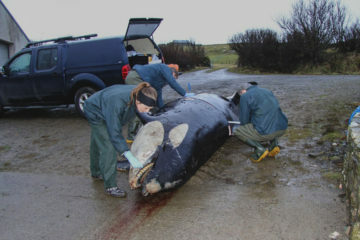 After a few years of field studies using photo-identification techniques to count killer whales, Bigg and his collegues Ian MacAskie and Graeme Ellis found that there were less than 200 animals from two resident populations (northern and southern) in coastal waters of British Columbia. 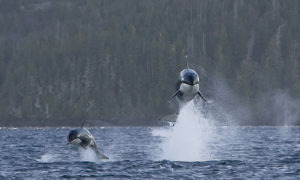 Only about 25 Transient killer whales were documented but there were few re-sights of these animals indicating that they may have ranged in and out of the study area and been part of a larger population. 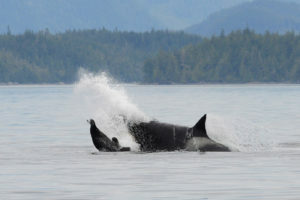 Further years of documenting the recovery of wild killer whale stocks in British Columbia led to more sightings of Transients but it was not until the late 1980s that researchers had observed them enough to begin to gain insights into what made them different. 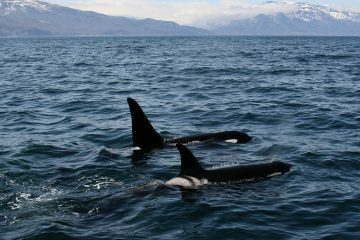 By comparison to Resident killer whales, Transients traveled in smaller groups, vocalized less frequently, and were less predictable in their movements. The reasons for this behaviour were not clear at first. 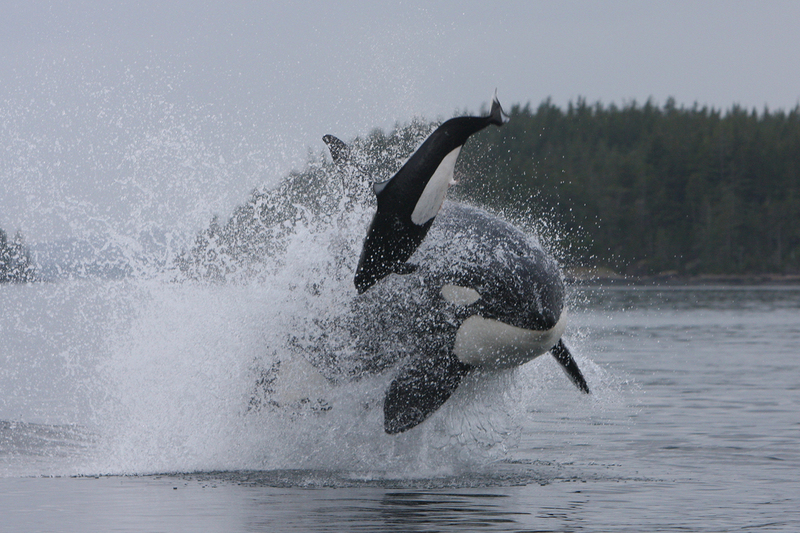 However, after witnessing several predation events it was realized that whereas Resident orcas only fed on salmon, Transients specialized in preying on marine mammals. It was most common to see them attack and consume harbour seals but they were also observed taking sea lions, porpoises, dolphins and young whales. 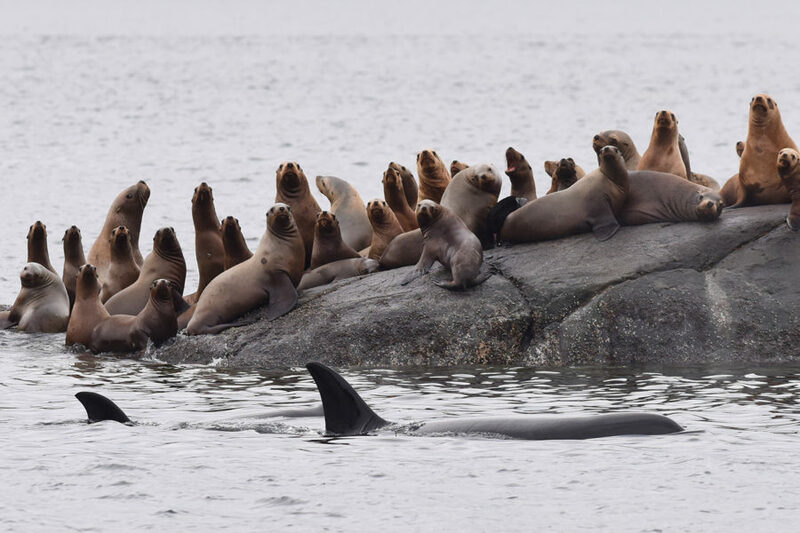 Considering that these species have excellent hearing and predator avoidance tactics such as their speed (porpoises and dolphins) or the ability to haul out on rocks (seals and sea lions), Transient killer whales relied on hunting quietly in small groups to take their prey by surprise. Owing to what was now known about the distinct diets of two types of killer whales that lived in the same waters, it was no wonder that several people who had caught killer whales in the 1960s and 1970s had difficulties feeding some whales. 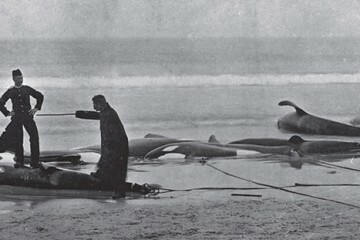 For example, Ellis states that “one group of orcas held in a pen in southern British Columbia in 1970 did not accept fish as food until the 79th day of their captivity and by this time one of the animals had starved to death.” It was many years later through analysis of photographs that Ellis determined these were in fact, Transient orcas (read here about this Transient family). In addition to the dietary differences between Transient and Residents it was also eventually noted that these two types of killer whale were morphologically distinct. 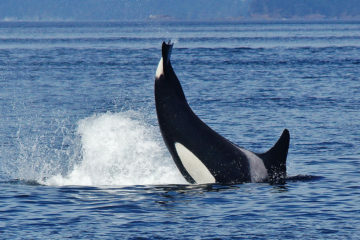 The dorsal fins of adult female Transients were more triangular and pointy on top than those of Resident orcas that by comparison were more curved with a rounded top. 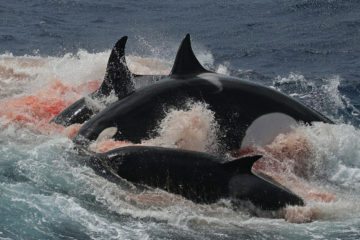 Further field observations and examinations of stranded whales also revealed that Transients were significantly larger. They can grow up to 8 meters. 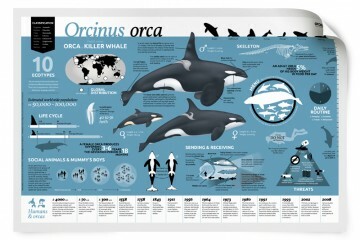 The maximum length of a Resident orca is around 7 metres. The combination of all these differences pointed out that these populations were not only behaviourally distinct but that it was likely that they were in fact very different types of animal that had not interbred for many generations. 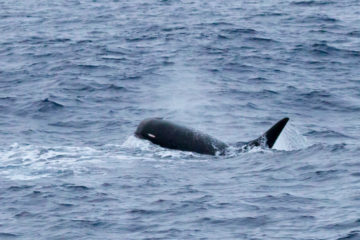 In a nutshell, Bigg’s initial work to count wild killer whales using photo-identification techniques had resulted in surprising discoveries about the complex, diverse and unique ecological roles exhibited by different sympatric populations of the world’s top predator. Furthermore, it inspired leagues of biologists to become involved in field studies of these animals. Before long, several further studies of Transient killer whales ensued. 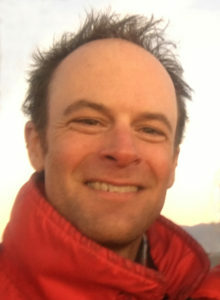 Biologist Robin Baird looked into different aspects of the unique social structure of Transient society and found that they kept their group size small to maximize foraging efficiency and that this was accomplished through dispersal. 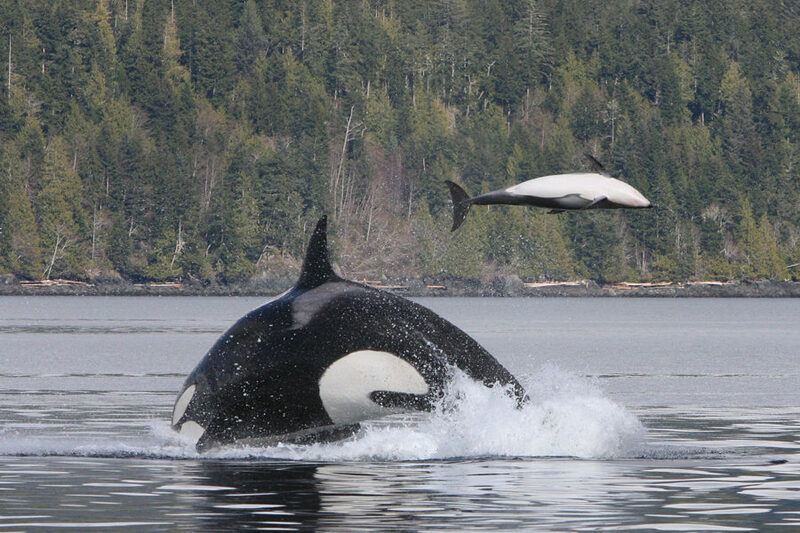 While dispersal from the natal group was relatively uncommon for Resident orcas, this behaviour was apparently normal and beneficial for Transients. 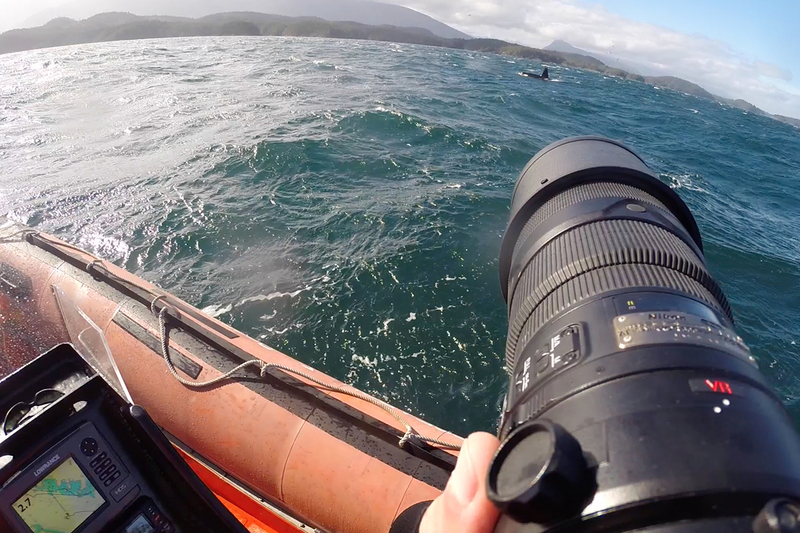 Meanwhile, biologist John Ford conducted research on the acoustic differences between Transient and Resident orcas. Whereas Resident populations had diverse acoustic repertoires consisting of distinct family dialects, most Transients recorded in coastal waters of British Columbia shared the same repertoire of very few calls. Finally, with the onset of genetic science, biologist Lance Barrett-Lennard was able to verify that Transients and Residents were indeed genetically distinct. All of this research revolved around ongoing photo-identification studies that Ellis carried on after Bigg’s death in 1990. With each year of data that Ellis collected himself and received from scores of contributors between Washington and Alaska many further insights into the lives of Transients were attained. Yet, with studies of killer whales now taking place along the entire west coast of North America, what was known about their populations became even more complex. 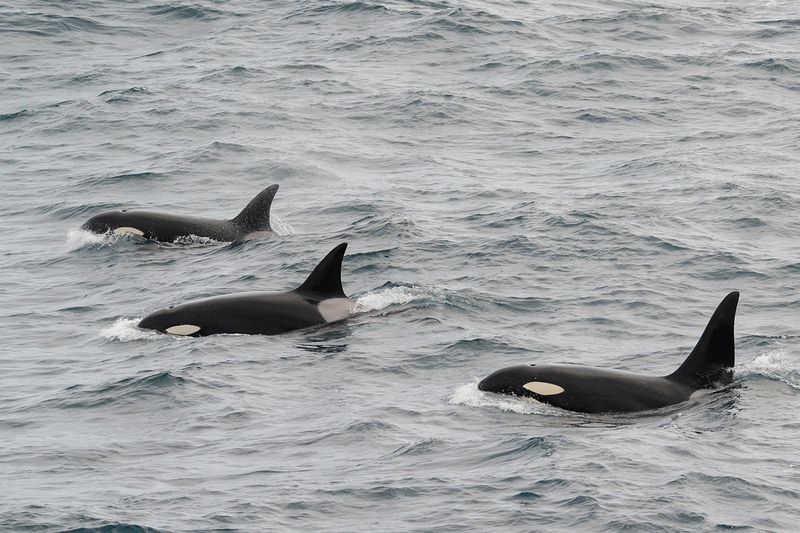 Transient like killer whales were documented nearly everywhere there was research effort. It soon became clear that just like Resident killer whales, Transient orcas belonged to several small populations. The west coast Transient population that was persecuted in the live capture fishery and the subject of early days of photo-identification research appeared to range exclusively between central California and southeastern Alaska. In and around the Gulf of Alaska, two other populations of Transients were documented. These populations were genetically distinct and did not appear to prefer mixing with each other or with individuals from the west coast population. In addition to these 3 populations, researchers began to document Transient type killer whales in the Aleutian Islands, Russia and Japan. To date, research by geneticist Kim Parsons has shown that at least 8 genetically distinct populations of Transients have been documented in the North Pacific. However, one of the other most surprising recent genetic discoveries about Transient orcas made by geneticist Phillip Morin is that they have been evolving in reproductive isolation from other forms of orcas for around 700,000 years! It is likely that resource partitioning between different groups of killer whales many thousands of years ago led to their initial social isolation and eventual genetic separation. Over the generations, the different groups each continued to successfully and respectably carve out unique roles as top predators in the marine environment. With such an astounding level of dietary specialization engrained in their evolution it is no surprise to learn exactly how important healthy marine mammal populations are for transient killer whales. In the 1970s and 1980s, populations of prey species along the west coast of North America were low and as a result Transients were very uncommon in coastal waters. For example, seal and sea lion populations were heavily decimated from culls that ended in 1970 and prior to the collapse of the commercial salmon fishing industry in the 1990s porpoise populations were continually diminished from incidental bycatch in fishing nets. In the 1990s, pinniped populations rebounded, porpoise populations began to increase and for reasons yet unknown, Pacific white-sided dolphins occupied coastal waters for the first time in decades. With healthy prey populations now distributed amongst many regions of the coast, the Transient orca population grew significantly. During the 20 years between 1990 and 2010 the known coastal population more than doubled from about 120 to 280 animals! Currently, the coastal Transient population may still be continuing to grow but at only a few hundred animals, this population is still rather small and is facing several threats. In addition to being affected by the availability of their prey, Transients are also known to bio-accumulate high concentrations of toxins because of their preference for feeding at the top of the food chain. Toxicologist Peter Ross has found that Transient killer whales are actually the most polluted marine mammal on the planet. In addition to toxins, chronic underwater noise such as that caused by shipping traffic as well as acute sounds such as naval sonar have potential to affect Transients in ways that are not yet fully understood. In any case, the existence of these and other threats to this small population has resulted in protection for west coast Transients. In 2003 this population was listed as Threatened under the species at risk act in Canada and in 2013 Ford and colleagues identified habitat that may be critical to the survival of these whales. Thus, in less than 4 decades the way that we value Transients has changed appreciably. This is a direct result of what we have learned from the long-term studies on this population initiated by Mike Bigg nearly half a century ago. 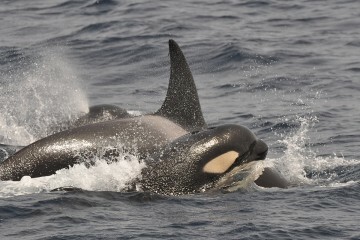 Interestingly, the animals that he initially called Transients are now more common and seemingly “resident” than Resident orcas along some parts of the coast and it is now argued by many that the genetic, morphological and behavioural differences between them and other populations are sufficient evidence to warrant Transients as a distinct species within the genus Orcinus. Thus, a more fitting name recently discussed and adopted by several authorities on the species may in fact be Bigg’s killer whale. 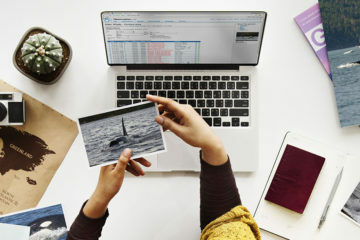 It is novel that the way we continue to learn about killer whales is still by use of the photo-identification techniques pioneered by Bigg and his colleagues in the early 1970s. For example, during my career in cetacean research I have been largely involved with studies on Bigg’s killer whales and have used photo-identification to document their demographic changes, range limits, movement patterns, behaviours, diet, threats and population designations. A strong reminder of the value of this technique occurred in 2014 a couple hundred miles offshore in the eastern North Pacific where my colleagues and I had the good fortune of encountering several groups of previously un-identified Bigg’s killer whales that looked and behaved differently from any others we had known. Due to their largely inaccessible environment it is difficult to know if we will ever understand much about these whales compared to the now common Bigg’s killer whales that range within the coastal waters off the west coast of North America. Regardless, it is clear that without the research pioneered by previous generations of cetacean biologists that our current understanding of killer whales and attitudes towards marine conservation in general would not be what they are today. Jared R. Towers, from Alert Bay, BC, leads the killer whale photo-identification program for the Pacific Biological Station, Fisheries and Oceans Canada. He also conducts conservation-focused research on the ecology, abundance, movements and behaviours of killer whales and several other large cetacean species such as blue, fin, sei, humpback, grey, minke and sperm whale in the North Pacific, South Atlantic and Southern Ocean.